Make Your Art About You! It’s a renaissance period for art and design. Back in the day, you would go to a shop and pick out a print and have it framed. The Selection was not great and the prices were high. Today, with design and print companies like Us, the art on your walls can be all about you, your family and the best times of your life. What could be better than displaying the best people and times of your life, getting a great result and not spend a ton of cash doing it. Sure pictures are great, and that’s what most folks have used to date but there is so much more you can do! And we’d like tyou ot consider us for that. Some of Our Best Designs Have Started With A Query. Without sounding too “cheesy”, now is a great time to embrace your artistic side. Believe it or not, it is common for many people to fear art. That sounds ridiculous but we have spoken to dozens of people over the years that are nervous about purchasing art of any kind. This often leads to people being in beautiful homes with nothing on their walls. We’re not saying you should by from us but you may want to try a few bits on your walls that you truly like. doesn’t have to be something major. Start small. If you like it, continue along until you surround yourself with a room full of art and things that make you happy. If it’s designy-type-stuff, we can help. if its brick-a-brack or sculpture or furniture ask a friend or enlist the services of a designer for a few hours to help you get started. We get a lot of calls from people all around Australia. We’re frequently told that they like the look of our designs but they don’t know names or lists what they could put on theirs. 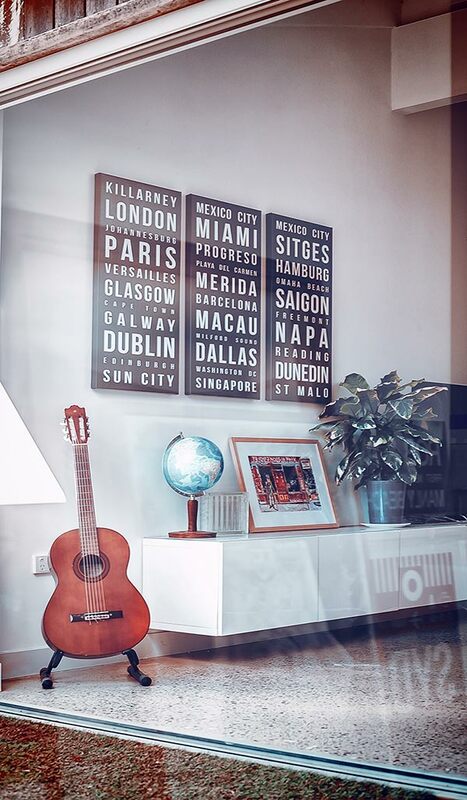 So if you are not the globetrotting type, here are a few ideas we’ve assembled that would make for great banner fodder ( is that one word or two?) This is the art that will make you smile every day. So, you have a great piece of artwork that will last forever and every time you see it you will remember the day but – not only that – you will remember all the guests that were there. Accomplishments are the milestones of life that make the struggle worthwhile. Be it a graduation which you celebrate as a right of passage or a well-deserved trip around the world with your flatmate, your partner, your wife, children or grandkids. These are times worthy of reflection and commemoration. Photos have been the graphics item of choice to do this, but we have more options now. Options that can be crafted to your decor and colour scheme. One option we offer is Typographic Art. not just words but the combination of graphic and typography to create a memoir that is completely unique. 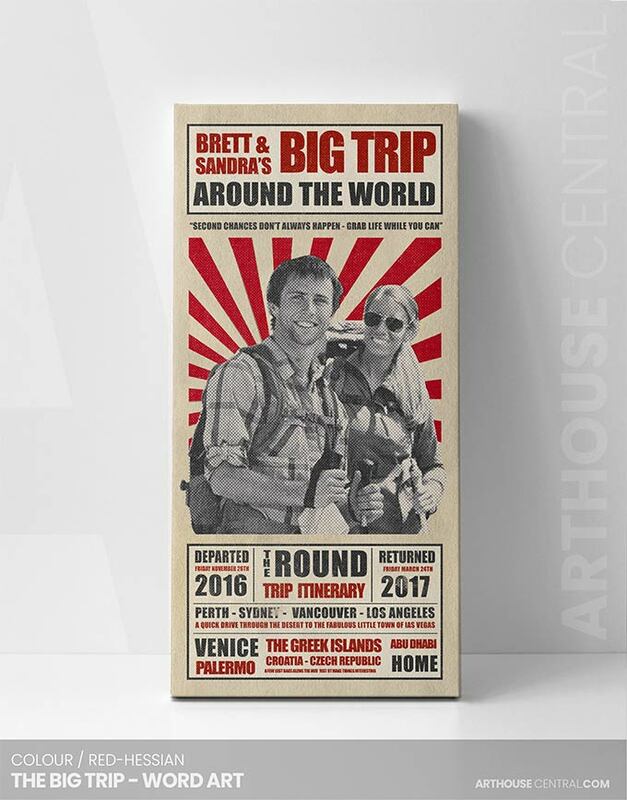 C’mon – you know no one is going to ask you about that trip unless you have one of these hanging on your wall! Soon after someone pulled the decomissioned Tram Banners from decomission Trams in Melbourne some one thought ” I bet this would look awesome in my lounge ( they probably didn’t use that term since it was the 70’s ). Long story, short: We’ve been creating tram banners for about 10 years now. 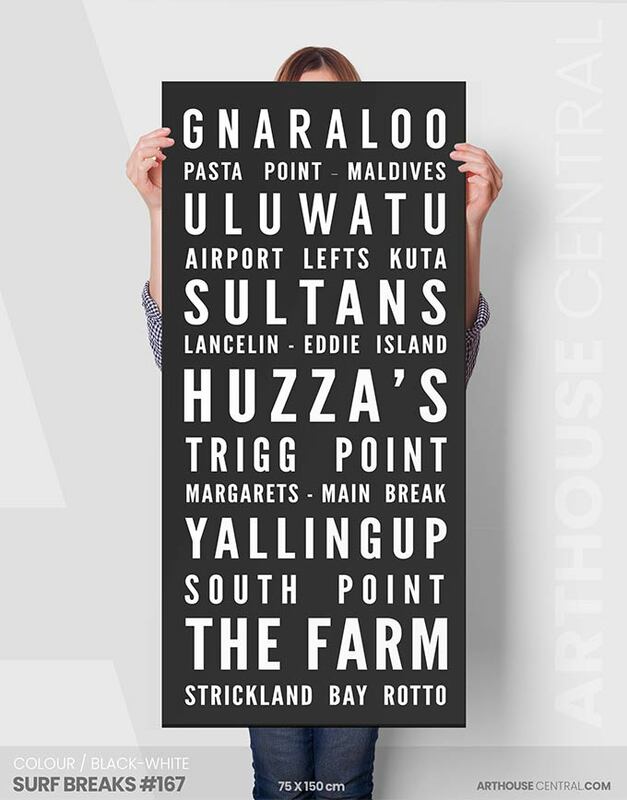 In the last few years the trend has gained steam and we’ve been adding ot our designs and shipping more of our art around Australia and the World. 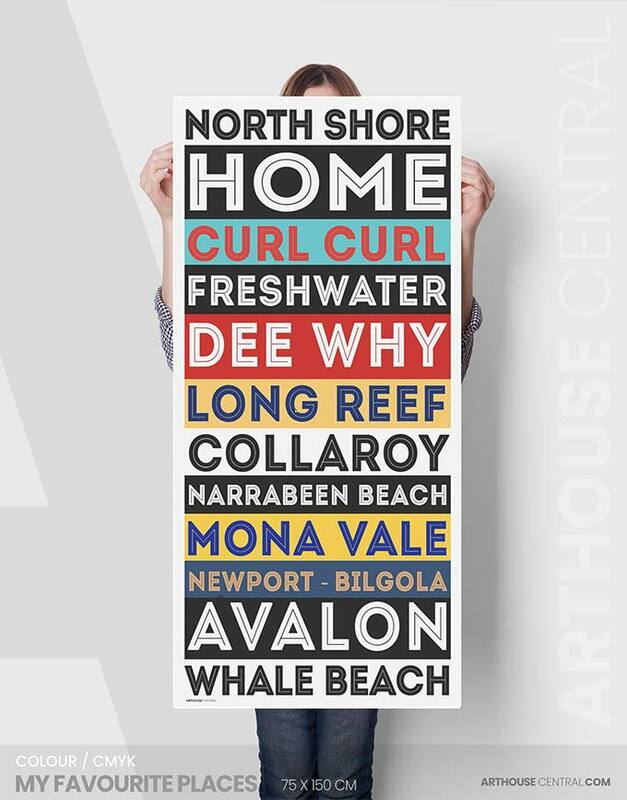 In fcat our Tram Banner Typographic Art is now residing on the walls in 11 coutries outside of Australia. Why shouldn’t your art be about your favourite things. A wise woman once said, “I want the same things from art as I do my spouse’. “I want it to look good, be unconfrontational and not empty my bank account”. It’s said in a humerous context but why shouldn’t the things you surround yourself with make you happy. Why not create a haven of quite satisfaction and reflection. Why not imbibe in a little visual yoga. It’s never a bad idea to surroound yourself with art and design that make you at peace. If you think you might find just a little bit thorugh our designs – we would honoured to assit. Please feel free to send us a notice or call our designer to ask about how we can assist you.